(see section Format of date/time below). no any css or image files, it works just out of the box. (see sub-section Build your own JustCal in section Download below). methods in sources of the script). Additionally, you can download JustCal with several languages and themes. Use Ctrl + mouse click to select/deselect several items. Use Shift + mouse click to select a group of items. First selected items will be set as default for lang and theme. on almost any element where you wish your date/time should be in. (note 'C' in uppercase in the name of this function). 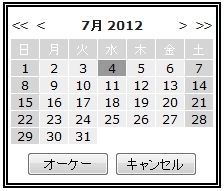 in other case it's innerHTML will be rewritten by given date/time. (hash sign (`#`) at the very beginning of the passed string will be sliced out). default values (see below) will be used. with specified properties as a second parameter to override any default setting. are shown in a table below. Note: '' in the second column stands for an empty string. (for full set of possible values see section Format of date and time). If not specified (is an empty string), it will be fetched from defaultFormat of current lang. instead of the value in target element. false Use time in picker. false AM/PM availability and 12-hours mode. false Use time with seconds. true Extra panel with OK/Cancel buttons. 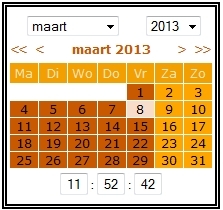 If false, simple click on date will choose it (insert into target element) and close widget. 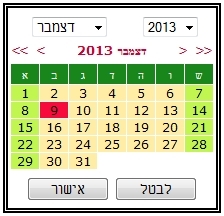 If true (default), clicking on a date selects it, and when OK pressed, selected date will be inserted into target element. By default all dates from Jan,1 of fromYear to Dec,31 of toYear (or dateLimit's past/future limits, if specified) are available to be picked. 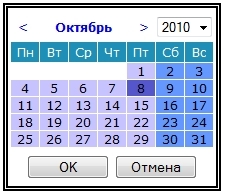 '-12' Values for the first/latest year in a drop down year selection. (with `+` sign for toYear and `-` sign for fromYear). When not specified (e.g. == -1) it will be fetched from the dow property of the current lang. 2 Number of characters for a week day to show in a header (Su, Mo or Sun, Mon). false Use only time picker. true Hide widget when ESC key is pressed. false If true, prevents hiding widget on clicking outside it. true Allows our widget to be dragged (default). See demo and section Localizations below. Note: if you do not want to have so many localizations, you can download JustCal with only one or several langs (see sub-section Build your own JustCal in section Download above). See demo below and section Themes above. Note: if you do not want to have all these themes, you can download JustCal with only one or several themes (see sub-section Build your own JustCal in section Download above). of date function in PHP language but with some restrictions. For full list of possible values in it see the table below. Note 1: Characters which are not shown in this table will be left untouched. Note 2: All textual representations of months and week days and AM/PM strings are localized for respective localization (they are marked by * sign). such as lang, theme, navbar, dateLimit and others. Change values in a form below and test JustCal. JustCal can be accessed by keyboard only. 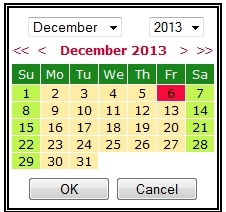 It supports cursor movements to select date by cursor keys and Enter key for submit selected date. Also it can be closed on ESC press by default. and press Enter to insert this date into text input, or press ESC to cancel. by keyboard, accessing them by Tab key. 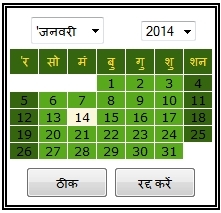 Each localization includes textual representations of months and week days. ar and fa localizations. For others it defaults to 1 (Monday). but you can not change textual string textAMPM in such a way. If you find any error or discrepancy in these translations please report to justcal@beotiger.com. Notice that changing default encoding can lead to broken symbols that are in non-ASCII character set. or some browsers can render such page in quirks mode which should be avoided mostly. which is called to create a new instance of JustCal class and show JustCal widget. in global scope of your page that has JustCal widget. triggers onchange event for the element.